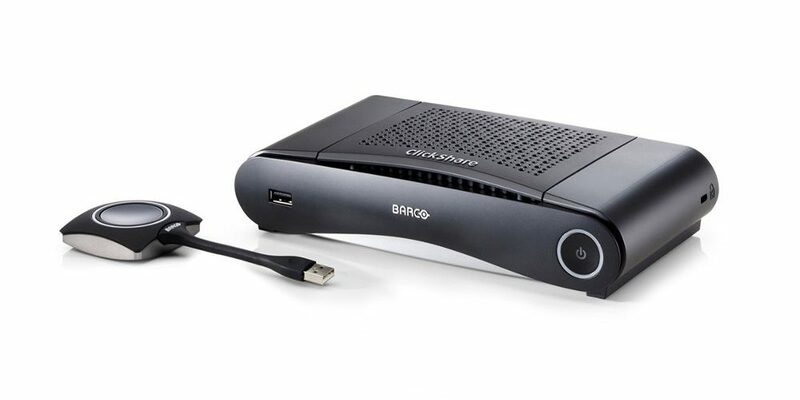 New ClickShare Models From Barco Promote Interactive Meeting Collaboration. 4K collaboration and huddle room tools round out Barco’s IT ClickShare enterprise solutions. Two new wireless enterprise products from Barco provide a dedicated huddle proposition and a 4K collaboration solution. With the addition of the ClickShare CS-100 Huddle and the ClickShare CSE-200+ to the portfolio, Barco ClickShare now has a complete offering of intuitive, IT-friendly collaborative experiences for every meeting room in the enterprise—shifting its focus from wireless presentation to interactive meeting collaboration. IT-friendly, flexible solutions for new environments and for more intense meetings. Feature-rich collaboration for all, both guests and employees. Share your way. Combining the ClickShare Button and App for advanced and more intuitive experiences. Uniform user experience throughout the entire enterprise. The ClickShare CS-100 Huddle, designed for huddle and small meeting spaces, brings spontaneous, ad-hoc and swift content-sharing—ideal for short catch-ups or instant brainstorming with a limited group of employees. With the ClickShare CSE-200+, new ways of meeting can be introduced in the current workplace. Brainstorming or more creative discussions are enabled by a wide set of features: annotation, blackboarding, touch back and 4K support with every type of device. The integrated HD switch in the CSE-200+ model takes away the stress and hassle of having to switch manually between wired legacy sources (such as cameras) and the ClickShare wirelessly presented content. Interactivity and feature-rich sharing is the way forward for the current workforce and creates opportunity to reach outcomes more quickly and increase their productivity and efficiency.